The custom crafted leather dog leash shows off the many details that make each product so beautiful from Around the Collar. The leather is specially dyed by skilled craftsmen for Around the Collar. Both the leash and the butterfly have painted edges. The butterfly really gets to shine amongst the single row of Swarovski Element Crystals and the single stone in the center of the butterfly. Each leash has 8 stones by the handle and 4 by the hook. The butterfly rests between the crystals near the handle. 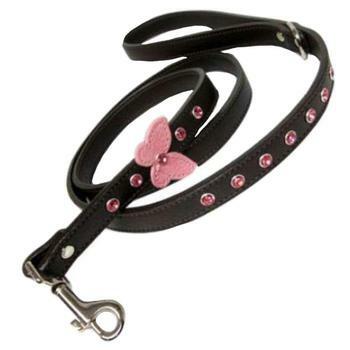 Leash is leather on both sides with hand-painted edges, as are the butterflies. A nickel D-ring is attached near the handle so you can attach a poop bag holder if you choose. The hook size varies according to the width of the leash.